Gloria Grahame or GG as we call her has been a wonderful addition to our home. She is working on house training and almost has it down. She is working on walking on the leash and does well. She does fine with my young kids and I think would be great in a variety of homes. I have not seen any aggression towards the pugs in the house or the kids. She loves to be petted and that is how you will win the timid girl over. Let her sit on your lap and pet her! She loves to chew so making sure she has her antlers and raw hides is important. Over all a healthy and very well behaved puppy mill girl! Interested in adopting Gloria Grahame? 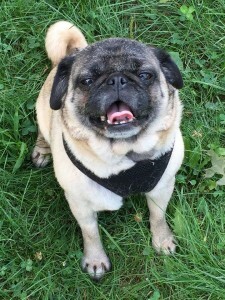 Please see our website and fill out an application at: www.pugpartners.com/adoption-application Gloria Grahame’s minimum adoption donation is $325.